"If you listen carefully, at the end you'll be someone else." The Mahabharata is one of the oldest classics of literature, a Sanskrit poem more than 3000 years old that tells a history of sorts of mankind. Indeed, the term "Mahabharata" means roughly, 'Great Story of Mankind.' This Indian national epic forms the basis for this adaptation by Peter Brook, from the play version by Jean-Claude Carriere. The cast from the stage production returns here for the filmed adaptation. As is the case with many ancient mythologies, genealogies are of prime importance in The Mahabharata. The story here tells of a royal family divided and ultimately driven to an all-consuming war. On one side are the five sons of Pandu (Tapa Sudana); the other side are their cousins, the hundred sons of Dhritharashtra (Ryszard Cieslak). When the eldest son of Pandu, Yudhishthira (Andrzej Seweryn) unwisely bets everything he has in a rigged dice game, he and his brethren are cast into exile with their wife Draupudi (Mallika Sarabhai) for thirteen years. At the conclusion of the exile, their cousins refuse to return their lands or even to grant them a place to live. A brutal war follows, enveloping all in its all-consuming frenzy. This is of course only the briefest thumbnail of sketches; the work itself is complex and much of that complexity survives in this adaptation. One of the benefits of DVD is the ability to go back and easily review segments, and that capability comes in very handy in sorting out the relationships of the characters. The initial hour is difficult going, to say the least, but once the viewer has his legs, the remainder of the piece is undeniably enthralling. Although the cast are playing deities and people with the blood of gods in their veins, the portrayals are at all times entirely human and accessible. Aiding that accessibility is the framing device of the poet Vyasa (Robert Langdon Lloyd) and the boy to whom he is relating the poem. They frequently weave in and out of the storyline, giving a human connection to the story that grounds it well for the viewer. As befits a 'story of mankind,' the cast here is international, coming from most of the continents and many different countries. The sole Indian amongst the cast is Sarabhai, who invests Draupadi with a dignity as well as a ferocity that lends her status as more than just window dressing (though she is undeniably striking). Other highlights include Senegalese actor Mamadou Dioume as the childlike but immensely strong Bhima, and Japanese actor Yoshi Oida as Drona, the tutor in martial arts for the many princes. Although derived from a stage play, the film (or more properly, three films) never feel stagebound in the slightest. At times there is a certain staginess, particularly in the impressionistic recreation of battle sequences. These don't detract at all, however, but are intriguing in their own right, particularly the dance of death of Arjuna's son as he faces unbeatable odds. While there is obviously violence, much of it is implied rather than shown onscreen. Image Transfer Review: The full-frame picture is the original aspect ratio, since this was originally shot for television as an international project. Accordingly, the picture is slightly soft. There are occasional splotches and bits of damage to the source print, but color is decent and shadow detail is generally very good indeed. I didn't notice any significant aliasing or edge enhancement. Video bit rates hover at a respectable 5 Mbps. Audio Transfer Review: The 2.0 audio track is quite satisfactory. Although there is a bit of hiss present, it's not overly obtrusive. Dialogue is generally quite clear (though subtitles would have been useful for making out the complex names). The Eastern music all sounds excellent, with good range, depth and presence. Clarity is excellent. I didn't notice any pronounced directionality, but the soundtrack is nicely enveloping. Extras Review: The sole extra is a substantial (54m:35s) documentary on the making of the film. Mallika Sarabhai tends to be the lead commentator, explaining much about the cultural history of The Mahabharata and its pervasive influence even today in Indian life. There is also significant exploration of the difficulties in making the transition from verse epic to stage drama to film. This is not a mere fluff piece; instead of the usual self-congratulatory talk, this documentary provides discussions of the essence of Dharma and the significance of the Bhagavad-Gita, a particularly important segment of the epic. In all, a very worthwhile extra that gets a higher grade than would ordinarily be the case for just a documentary. Chaptering is very thin, with fewer than five stops per hour. Again, subtitles would have been nice. 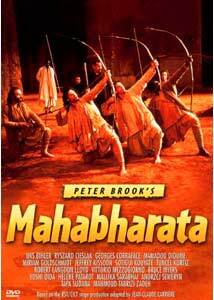 Acclimating one's self to the world of The Mahabharata can be less than easy, but the result is well worth it, for Peter Brook fascinatingly recreates the verse epic. Recommended.